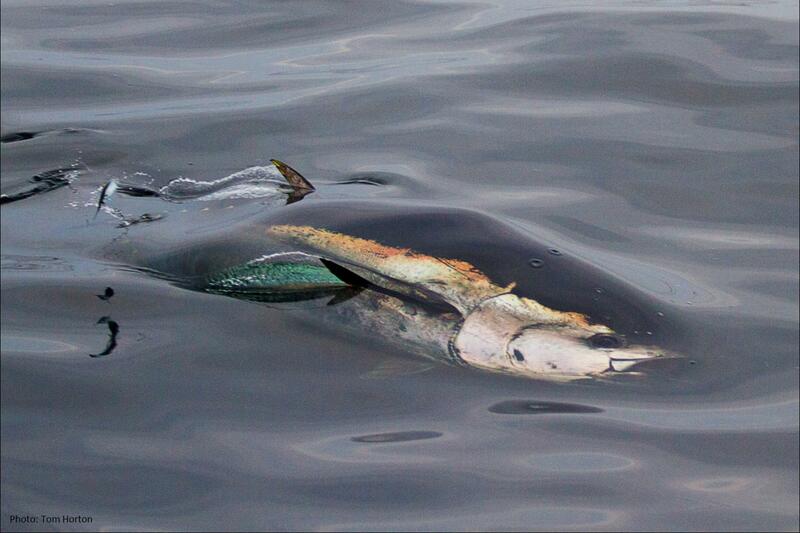 Atlantic bluefin tuna are known for being amongst the biggest, fastest and most valuable fish in the sea. They were once a common sight in UK waters, ranging throughout the Celtic and North Sea. However, they largely disappeared from British waters in the 1990s, possibly due to overfishing, and are now recognised as an endangered species. In recent years they have been observed more frequently in UK coastal waters, particularly during the late summer, autumn and winter as they move into coastal areas to feed on energy rich fish such as sprats and herring. Atlantic bluefin tuna can migrate over huge distances, moving over the entire Atlantic Ocean to North America and back again in a single year, crossing both coastal waters and the deep offshore. They are top predators of the seas and are fast, energetic and powerful fish with considerable commercial and conservation interest. However, despite historic evidence, we know little about their movements, for example how long they stay in British waters and where they go once they leave our coastal environment. Improving knowledge on the species is an important first step for securing a positive future for Atlantic bluefin tuna around the UK. The University of Exeter and the Centre for Environment, Fisheries and Aquaculture Science (Cefas) have embarked upon a two-year scientific study, supported by the Department for Food, Environment and Rural Affairs (Defra) and the European Maritime and Fisheries Fund, to deploy state-of-the-art animal tracking devices to find out where Atlantic bluefin tuna in UK waters go. Scientists will work with stakeholders including commercial fishers, recreational anglers, wildlife watchers and NGOs, to share knowledge, and to deploy around 40 satellite tracking devices. The project was officially launched at the Environment and Sustainability Institute at the Penryn Campus of the University of Exeter. More than 40 stakeholders attended to meet with the project team, to hear about the biology and ecology of bluefin tuna and how the THUNNUS UK project will help to provide more information, and to ask questions and offer information in both formal sessions, and during informal discussions. The workshop, the first of four in the project, was well received by the stakeholders and the project team were delighted with the outcome. Dr David Righton, lead scientist on the project for Cefas, said: "This exciting collaboration will enable us to gather and share knowledge of this incredible species, and uncover the role they play in UK waters. "Cefas has a long history of investigating the behaviours and migrations of many species of fish, and we're looking forward to using our expertise to address some of the fundamentally important questions that need answering about bluefin tuna. "The enthusiasm of the people that came along to the project launch was terrific, and it give us all great hope that the scientific data that the tagging programme will bring can combine with the observations and information of fishers, sailors, observers and anyone else who spends their time close to the sea." Dr Matthew Witt, lead scientist on the project for the University of Exeter, said: "This a ground-breaking project for the UK and another important step towards the use of evidence-based approaches for marine conservation. "These are huge, exciting top predators, yet with an uncertain future. We are incredibly excited to be able to work on these fish, which I suspect to many conjure thoughts of tropical warm waters, yet they are here in our coastal sea. "The next few years will be challenging, exciting, yet hugely revealing regards their movements and biology."